It would seem that period and antique engagement rings are becoming increasingly popular with international celebrities. Perhaps the first to kick off this recent trend was Welsh beauty Catherine Zeta Jones, who in 2000 received a ten carat antique marquise cut diamond engagement ring dating from the 1920s from Michael Douglas, with an estimated value of around two million dollars. 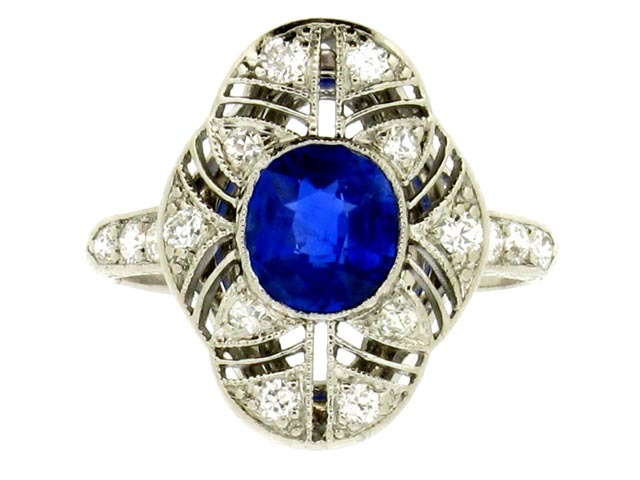 Though not of Hollywood fame, in 2005 Camilla Parker Bowles was given an Art Deco diamond ring by Prince Charles. Set with a central emerald cut diamond flanked by six diamond baguettes, it was once owned by the Queen Mother. Another family heirloom, Scottish actor Ross McCall proposed to American actress Jennifer Love-Hewitt in 2007 with an antique diamond ring that had been in his family for over one hundred years. The following year another American starlet, Scarlett Johansson, became engaged to actor Ryan Reynolds with an antique cushion cut diamond solitaire on a gold band. And in late 2009, the Spanish pair Penelope Cruz and Javier Barden became engaged, the ring being an antique sapphire and diamond cluster ring on a gold band, all the stones in collet settings. Finally, just this year British comedian David Walliams proposed to his Dutch supermodel girlfriend, Lara Stone, with a period ring dating from the 1930s composed of a diamond centre stone with diamond set shoulders. It is no surprise that the world's most stylish women are wearing antique engagement rings, as they will ever be a fashionable yet timeless choice.